This trip is harder than it looked from a geological perspective. Younger rocks like the Eocene Queen City Sand show more details than we can see in Paleozoic rocks like the Hartselle Fm. in N. Alabama. This makes it difficult to make sweeping statements about them. Anyone who has visited the central Gulf of Mexico knows it looks muddy, but the sand lies at the bottom and wherever the waves are strong enough to remove the finer clays. The ledges of Barwnmell Mtn. 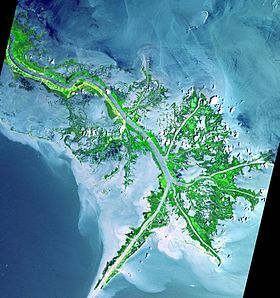 are mostly mud as described in the previous post, but there is no clear separation of mud from sand in a delta, where enormous amounts of mixed particles arrive from rivers like the Mississippi River. This photo was taken with a 15x macro lens on my iPhone. 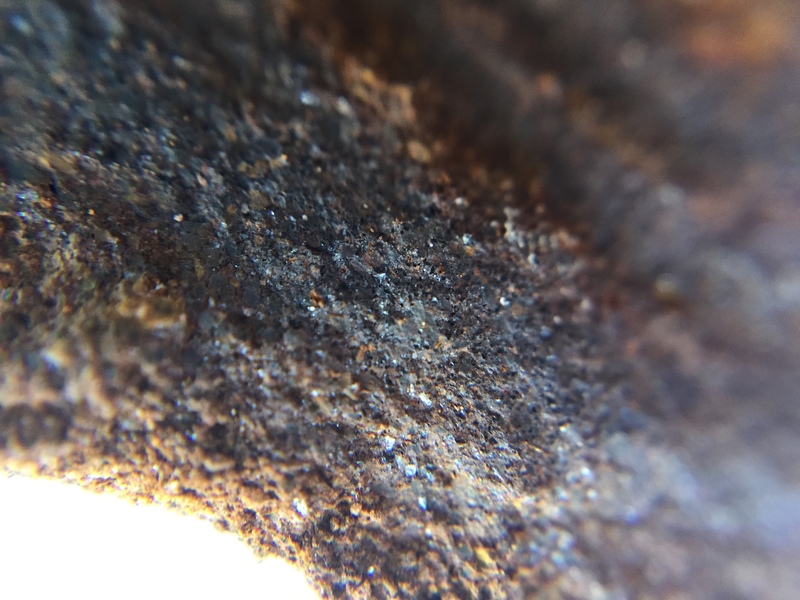 It shows sand grains in the shale sample I discussed before. Most of the shiny particles are sand grains. This is important from a wheeling perspective, because even a little sand in a fine matrix improves traction (like the paint we buy for porches and garages). Both of the samples I collected contained these sand grains. The next major issue I discerned from my samples and trip was the red mud, which is the result of oxidation of iron (Fe) with lots of oxygen. The samples were both dark grey inside, which indicates no iron oxidation The red color seen in concentric zones in my samples, and the entire mountain, was from exposure of these sandy shales to the atmosphere as they erode and fracture. This photo with the 15x lens shows the amount of void space (i.e. porosity) in these rocks. Note the small pores seen in this image, which fill with water in this part of Texas, but with oil far to the south. I can’t explain easily the blue color, which was not seen until the magnification was this great. This brings me to the last (almost) point I want to take from this trip. The sedimentary rocks deposited in the SE U.S. (specifically AL and TX) contain a large amount of iron, which produces iron ore (e.g. Birmingham was the only major iron production center in the south prior to the U.S. civil war). These rocks also contain so much Fe that they must be filtered for consumption from water wells in NE TX. Geologists don’t know why because the source rocks for all of this Fe are long gone (they’re remnants reside in these rocks and the Black Warrior Basin of AL). 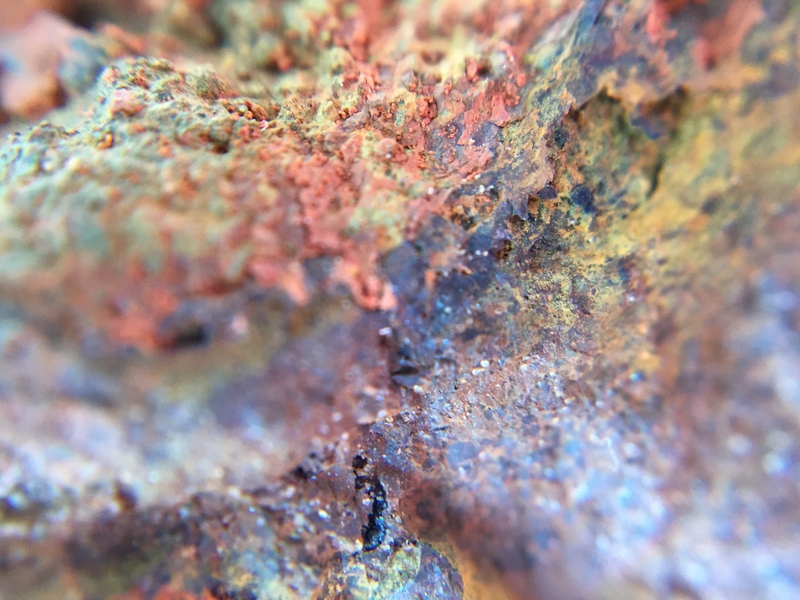 Iron has been mined from carbonates (limestone) in PA from this geological period, but that is another story. The bottom line is that when ocean (aka marginal sea) circulation is just right, there is not enough oxygen to keep Fe active (so to speak). This is very localized, which brings me to my final point. Enough said about my limited understanding of NE TX geology, but it does make for interesting wheeling…next stop, Colorado…see you there and then!